The MacBook Pro, unlike the Air, is designed for more intensive tasks. So when that same MacBook Pro starts running slow, what then? I was beginning to think I'd need to replace my five-year-old MacBook Pro — it was running slow and I'd lost count of the number of times I had to restart unresponsive programs. But, after I tried a few easy fixes, my computer was running almost like new. There are a number of different causes for a slow MacBook Pro, and, thankfully, a number of solutions that will often remedy the issue without expensive upgrades or replacing the computer entirely. Clutter spells disaster for any computer, yet most users don't clean up their computers often — if at all. When your MacBook Pro starts running slow, the first (and easiest) step is to declutter. Start by checking your hard drive. 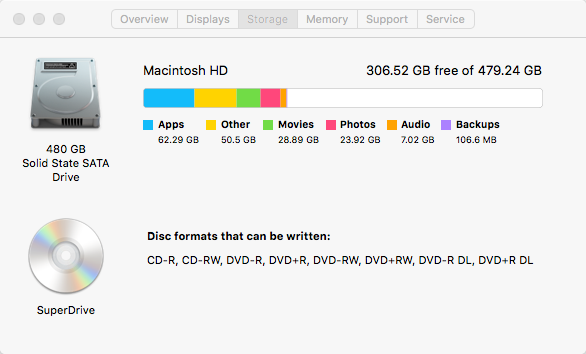 Ideally, your hard drive shouldn't be more than 85 percent full. Click the Apple icon in the upper left corner, then About This Mac and then select the Storage tab. If your hard drive is more than 85 percent full, start moving some old files to an external hard drive or deleting﻿ unnecessary ﻿app﻿s and files, especially duplicates. With the hard drive under wraps, take a look at how many programs you have starting automatically — which will bog your MacBook Pro when it powers on. Go to System Preferences, then Accounts and Login items. Un-check any programs you don't use every time you turn your computer on (see how to optimize Mac startup for more). When you shut your computer down, also make sure that the box that says "Reopen windows when logging in" is not checked. A cluttered desktop and widget bar will actually slow your computer down too. First, start by moving anything stored on your desktop to your hard drive. If you want quick access, create a shortcut on the desktop. Storing programs and files right off the desktop (instead of on your Mac's hard drive) will slow your computer down. Then, go through your widget bar and eliminate any options you don't use often (remember, you can find them again easily by searching with the magnifying glass in the upper right corner). If you prefer a faster and thorough cleaning​, try this app called CleanMyMac. The RAM is the MacBook Pro's short term memory. Everything the computer is currently using is stored there for quick access. When that RAM is full, the computer has to pull from the hard drive, which isn't as quick. 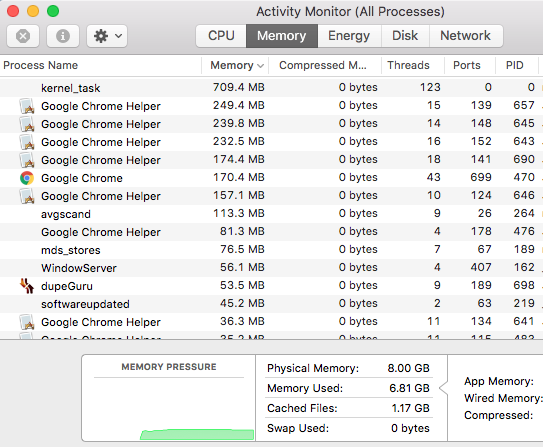 To see if the RAM is the issue, open up Activity Monitor and click on the Memory tab. The graph at the bottom should ideally be green — yellow and red are good signs that a lack of RAM is the reason your MacBook Pro is running slow. The simplest way to fix a lack of RAM is to adjust your computer habits. First, avoid multi-tasking and close programs when you are finished with them. But, you can also find out what programs are causing the most problems. Inside Activity Monitor, click CPU, then % CPU to order the programs by how much RAM they are using. Once you see what programs are taking up the most RAM, you can find the best solution. Often, trying an alternative program helps. One of the ways I sped up my MacBook, for example, was by swapping out Firefox with Safari. Third party web browsers are a common cause of MacBook slow downs — and an easy fix. If multi-tasking is a must and you can't part with your most intense programs, you could take your MacBook in and upgrade the RAM, though that's certainly a more expensive solution. While Macs may be better at warding off viruses than PCs, they're not immune. Malware are programs that hitchhike a ride off an internet download. They aren't like a virus that aims to crash your computer, but they do track your information, send you pop up ads and slow your computer down while doing so. The Malware Removal Tool is included with OS 10.8.3 and later and runs automatically, so if you suspect you have malware (a good sign is unusual pop-up ads), updating your operating system will correct the issue (see solution 4) or run Bitdefender Antivirus for Mac to have a quick scan of your Mac system. To prevent the issue in the future, avoid downloading anything from untrusted sites — always go straight to the manufacturer's website or Mac App Store for downloads. One of the biggest ways I sped up my MacBook Pro was by upgrading the operating system. The "check for updates" feature said there weren't any updates available, but Apple actually offers the latest OS update for free, provided your MacBook isn't more than ten years old. Updating is simple, though takes a bit of time. First, back-up your files to an external hard drive so if there's an issue with the update, you don't loose anything. Then, head to the official Apple website and follow the update instructions.